Today we had the pleasure of hosting our District Governor. 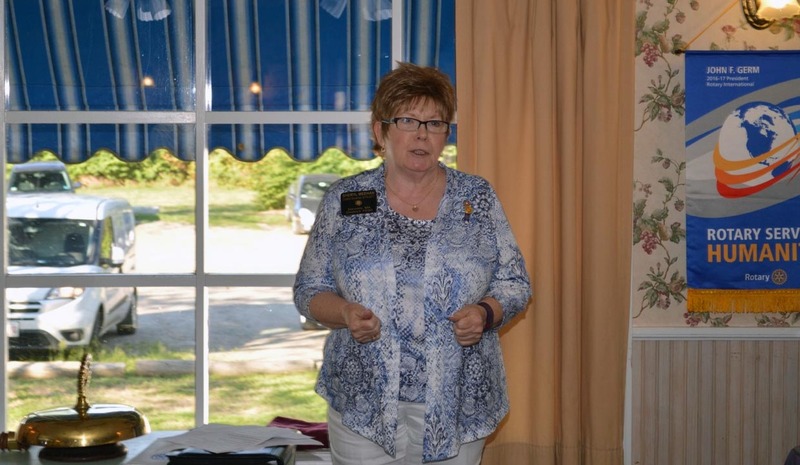 Sheryl shared her passion for Rotary and inspired us for the year ahead. From left, District Governor Elect David Gardner, President Lisa Shanko, District Governor Sheryl Meehan, and District Governor Nominee Bob Wood. DG Sheryl inspired us with her heartfelt message and plans for the coming year. Chris Doktor presents the "Candle of Friendship" from the Hyannis Rotary Club. Chris received the candle during a recent visit as the Rotarian who had traveled the farthest. A Rotarian visiting from Austria had received the candle the week before. Timing is everything. As agreed, this photo will be returned to the Hyannis club as a sign of our appreciation and friendship.